Hotel rooms are not included in the FTD Boot Camp registration fee. FTD Boot Camp attendees must book their own hotel rooms. Click the "Book Room" button below to receive FTD's corporate rate, which is $133/night plus tax. FTD's rate includes FREE breakfast daily and FREE high-speed internet access if booked using the link provided below. 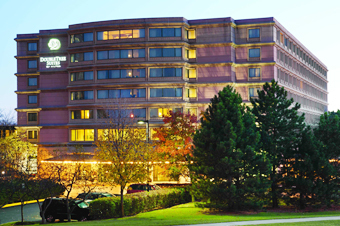 The DoubleTree Suites Downers Grove is conveniently located just across the parking lot from FTD. Hotel guests are also able to pick up a complimentary pass for the Esplanade Fitness Club connected to the hotel. Attendees are welcome to stay at the hotel of their choice. Enjoy a warm and welcoming stay at this hotel in Downers Grove, IL, located in tranquil surroundings outside bustling Chicago. Unwind in a spacious two-room suite and enjoy a living room, separate bedroom, two televisions, a refrigerator and a microwave. Relax with a drink at the lobby lounge and indulge in Italian or American cuisine at Esplanade Restaurant.